The Codonics Virtua Medical Disc Publisher offers exceptional speed, efficiency and ease of use in an automatic disc recorder. This innovative medical device is a DICOM-compliant network appliance that can concurrently record and label multiple medical studies onto CD and DVD media. Virtua XR records up to 60 CDs or 30 DVDs an hour*, keeping pace with multi-modality environments such as breast MR, PET/ CT, MRA and CTA. Customized discs are recorded, labeled and ready to leave with the patient without workflow interruption. 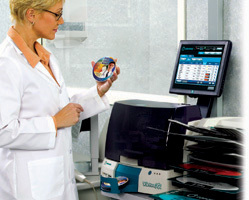 Virtua's compact design features an advanced embedded processor, robotic disc handling and a user-friendly touch screen interface that optimizes workflow and productivity. 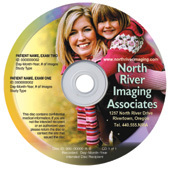 The built-in printer produces brilliant, full-color disc labels that include patient demographics and the facility's address and logo for marketing. Customers can create their own custom labels or use Codonics disc label design service offered exclusively to our customers. Not all features available on all models. Specifications subject to change. This model/configuration of Virtua is not available for purchase or use in the United States.